The home that exploded when caught in the fires. 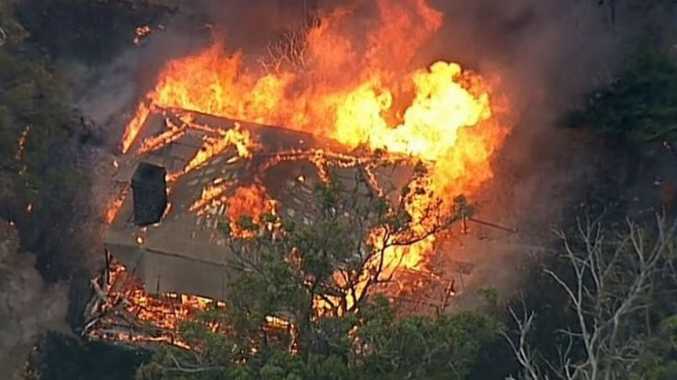 Out-of-control blazes are raging in Victoria's east with communities being told it's too late for them to leave tonight in what is being described as the state's worst bushfires since Black Saturday a decade ago. In Crooked River, southeast of Omeo, communities of Cowa, Crooked River, Gibbs, Hawkhurst, Howittville, Shepherdson, Talbotville, Winchester and Wongungarra were told it is too late to leave and to shelter indoors immediately, the Herald Sun reports. The fire is travelling towards Howittville and could hit anytime in the next hour. Several communities 7km northwest of Dargo, have been placed on the "watch and act list", with VicEmergency saying leaving now is the safest option. Black Snake Creek, Cowa, Dargo, Hawkhurst, Miowera, Peter the Swede are affected. 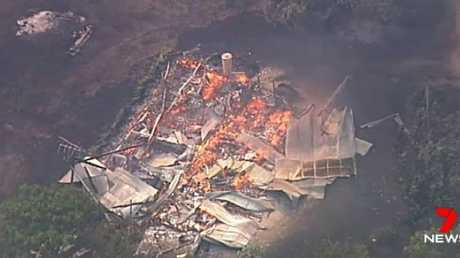 South of Morwell, a bushfire remains out-of-control near Yinnar South. Emergency services have told communities southeast of the fire to enact their plan now. The warning includes Budgeree, Budgeree East, Jeeralang, Jeeralang Junction, Jeeralang North, Jumbuk, Yinnar and Yinnar South. 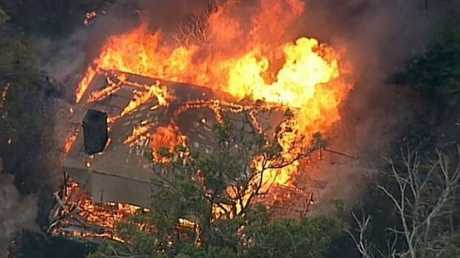 Earlier today, the moment a home caught in the Victoria bushfires exploded was caught on camera, a victim of the Bunyip State Park fire, which started from multiple lightning strikes, has burnt more than 6000 hectares and is racing towards the Princes Highway. It is dangerously close to two electricity transmission lines linking the Latrobe Valley and Melbourne. Just moments before the home exploded. Country Fire Authority assistant chief officer Trevor Owen worked on fires in the same park in 2003, 2006 and 2009's Black Saturday fire, which also started by lightning. "Under those very strong conditions experienced on that day (in 2009), it travelled neatly. 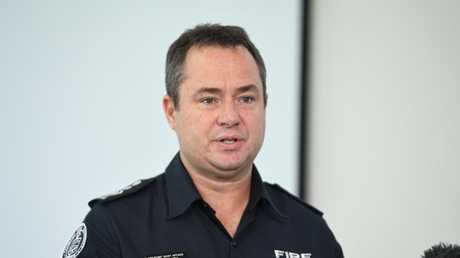 Whilst it damaged some property it was a very narrow finger compared to what we're facing with this fire, because this fire has been growing," Mr Owen told a community meeting in Pakenham on Sunday. "What we've been doing is throwing everything we've got at the fire." 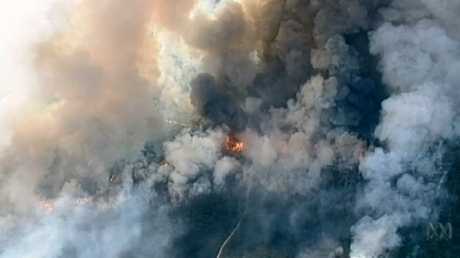 There are 850 firefighters, with 110 fire trucks, bulldozers and aircraft, fighting the blaze. Despite the resources, the fire is so large, terrain so difficult and wind so gusty that crews are focusing their efforts on stamping out spot fires to reduce the spread and protect assets. Three properties have already been destroyed and more loss is anticipated, with a wind change moving the fire front and possible lightning expected. "We are confirming there are three structure losses, it does appear that they could be homes," Emergency Management Commissioner Andrew Crisp told reporters. "This is an active fire, it is moving, and there is every likelihood there will be further property losses." Labertouche is expected to be impacted by the fire on Sunday afternoon and about 30 homes were doorknocked and told to evacuate. Others in areas including Bunyip, Cornucopia, Garfield, Gentle Annie, Longwarry, Maryknoll, Nar Nar Goon, Tonimbuk and Tynong have been told it is too late to leave and to take shelter immediately. Three relief centres have been set up for residents forced out by the fires. 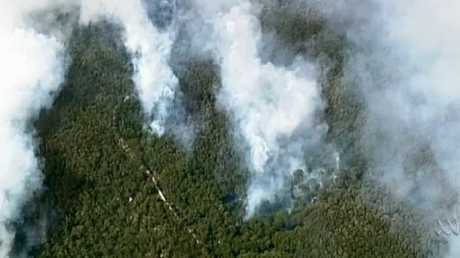 Two homes were also lost in the Budgeree-Wilsons Promontory fires, incident controller for those blazes, Peter West, told the ABC. 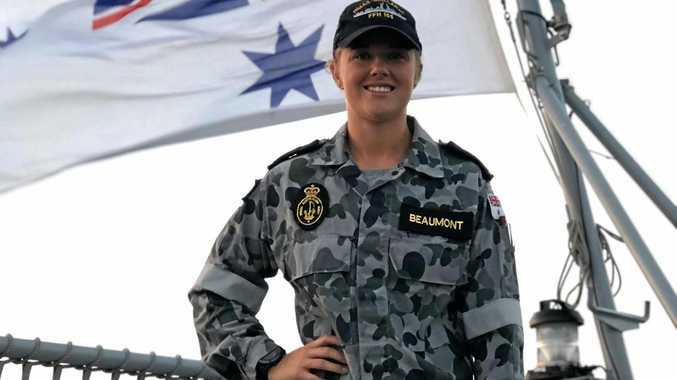 "Unfortunately we've had confirmed two house losses with the fire and some unconfirmed reports about other assets," Mr West said of the Budgeree fire. Campers and day trippers had to be evacuated from Wilsons Promontory. An emergency warning has since been issued for Dargo in Gippsland on Sunday afternoon, with a watch and act remaining in place for Licola. The bushfire near Dargo is out-of-control and travelling towards the Howittville and Shepherson areas, and is expected to impact them in the next two hours. It is too late for residents in these areas to leave and the safest option is to take shelter. 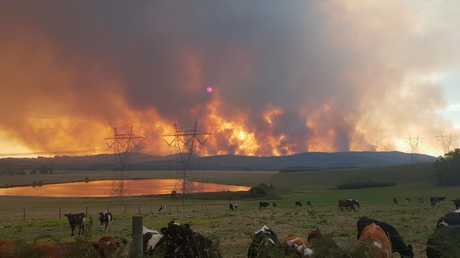 The Licola fire was also started by lightning but the fire is currently travelling away from the township, Mr Crisp said. A wind change is making its way across the state and will present new challenges for fire crews. "It is a dangerous time, putting it bluntly. Not just for communities, but for firefighters, and we're very conscious of the safety of our firefighters and we will message in relation to that," Mr Crisp said. At a press conference alongside Mr Crisp, Premier Daniel Andrews told people to follow warnings from authorities. "Don't put yourself in harm's way and potentially add to the already considerable workload our firefighters have," he said. 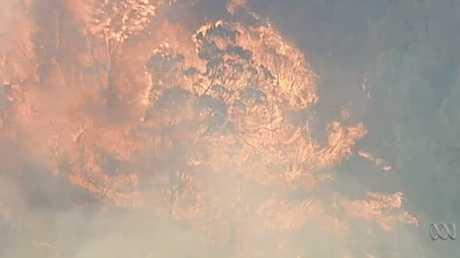 There are more than 30 other fires still burning across Victoria. The hot and windy conditions are expected to linger until Wednesday.